Tekiō is a glowing series of modular bamboo lights that can be adapted to take on any shape. Designer Anthony Dickens created the luminous lamps solely from bamboo and paper and launched them at Clerkenwell Design Week. 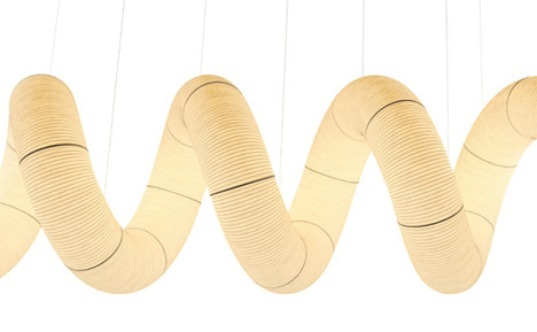 Inspired by traditional 10th century Japanese ‘chochin’ paper lanterns, the London-based designer wrapped paper over thin strips of bamboo connected over a frame with a light inside. The name ‘Tekiō’ was taken from the Japanese word for ‘adaptation,’ speaking to the way the traditional item was transformed into a new and flexible design. Dickens incorporated a frame within each paper tube that can be locked in any shape, such as a standalone pendant or floor lamp, or even a glowing room divider. The lamps also take a choice of either LED or CFL bulbs. Tekiō is a glowing series of modular lights that can be adapted to take on any shape. Created solely from bamboo and paper by designer Anthony Dickens, this illuminating lamp installation was launched at Clerkenwell Design Week when Dickens created the curved forms which snaked around the main venue of the Farmiloe Building. Inspired by traditional 10th Century ‘chochin’ paper lanterns the London-based designer wraps paper over thin strips of bamboo which are creased at points to create a concertina effect and connected over a frame with a light inside. The name 'Tekio' is taken from the Japanese word for ‘adaptation’ as the traditional item has been transformed into a new piece of flexible design.